Indianapolis Flooring store, Kermans Flooring, gives away a beautiful area rug each month! Our store selected another lucky Rug-A-Month Giveaway recipient: Bruce Juntgen from Indianapolis, Indiana. After Bruce's name was randomly selected from our fishbowl entries, he stopped by the store to pick out his new area rug. He selected a brown shaded rug with intricate designs. 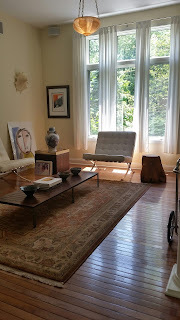 He placed the new area rug in his living room to add warmth and decoration to hardwood floor space. Congratulations Bruce! Considering new hardwood floors for your room? Choosing a hardwood floor is choosing an investment that will increase in value as you and your family enjoys it. Wood floors add timeless value and style to any home. And contrary to popular belief, there are beautiful hardwood options in all price ranges. Find our more information on the Kermans website or visit our showroom to talk to one of our consultants.